Stream Network Agents are the best of the best in the repossession industry. 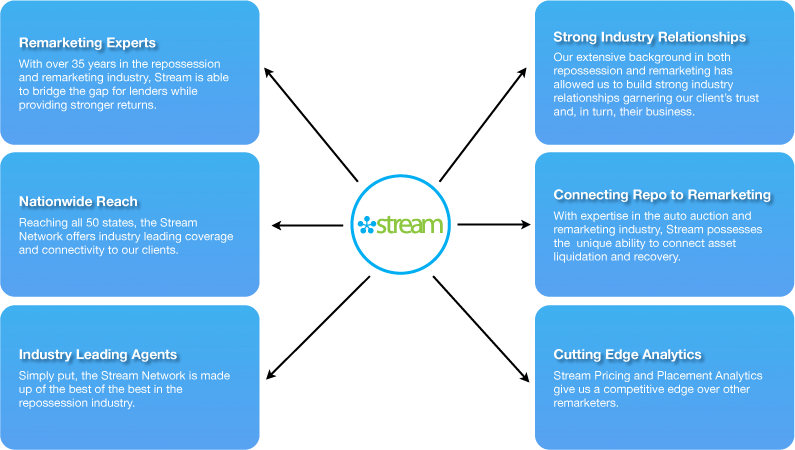 Stream partners with the most advanced and professional repossession companies nationwide in order to provide our clients with the most technologically advanced and efficient remarketing service available. Our Network is extensively vetted and has completed a comprehensive certification process. You can rest assured that your vehicles are in the hands of the best agents in the industry. Along with a network of the best agents in the business, our program of upstream first remarketing connects leading repossession companies and clients to an integrated solution for asset liquidation which consistently produces a faster and more cost effective recovery and remarketing process.